Books to me are magical – they are organic chocolate for my soul. 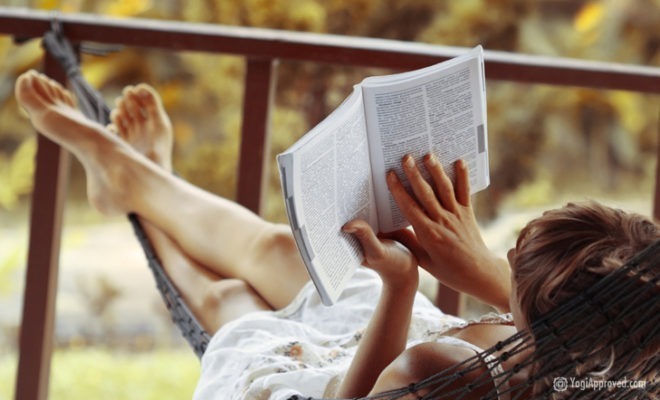 A book is like an enchanting world waiting to be discovered, and nothing beats reading a good book whilst lying in a hammock on a lazy fall evening. I am reasonably new to yoga, but like many, my yoga journey found me. Along the way, I have encountered some great books that enrich my yoga practice and inspire me to continue on this new path. If you are a lover of books as much as me, then you are in for a treat. The following 5 books focus on yoga as a way of life, Yoga Philosophy, and Holistic health. Most of these books are easy reads to flip through, and a couple are a little more esoteric. 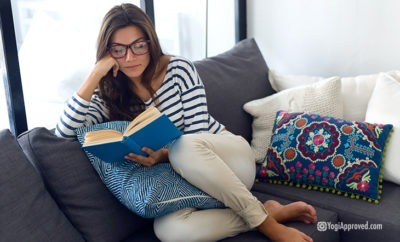 Get comfy, and get ready to stick your nose into some good books! 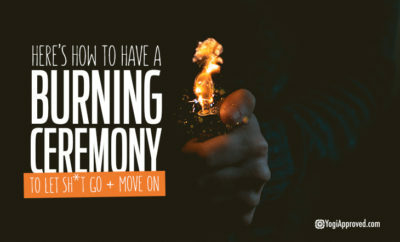 This is a guidebook on how to make a living teaching yoga. 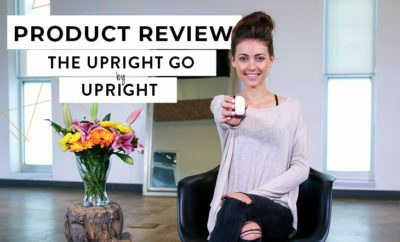 It’s small enough to shove in your bag and has a magazine quality to its pages and overall design, which makes sense since the author is also the editor of Om Yoga Magazine. This handy little book is crammed with positive quotes, interviews from yoga teachers, and tips on how to be the best yoga teacher you can be. There are chapters on marketing, picking the right yoga teacher training, how to run workshops, identify your strengths and apply them to your classes, and skillfully promote your business. It’s a fun read with lovely graphics and stunning photos throughout, and an inviting writing style. 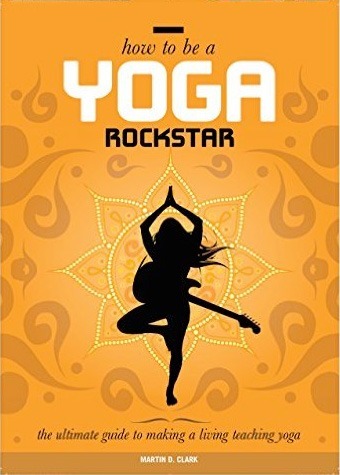 Unlike some guidebooks out there, How to be a Yoga Rockstar is far from pretentious and exudes a warm friendliness to its readers as though chatting to an old friend over tea. 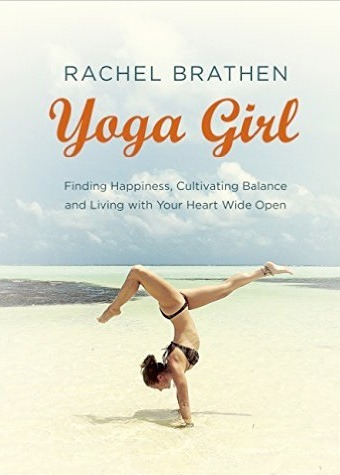 This book is heart-warming (and a very pretty coffee table book) that is part self-help and part memoir of Rachel Brathen’s life journey and how she discovered yoga. This book is inspiring for any yogi that desires to write their own book. Yoga Girl is an inspirational look at the adventure that took writer and yoga teacher Rachel Brathen from her hometown in Sweden to the jungles of Costa Rica, and finally to a paradise island in the Caribbean that she now calls home. The pages feature gorgeous photos of Rachel practicing yoga and highlighting her yoga lifestyle. Readers are also taken on an in-depth journey through her darker self-destructive teenage years to the happier, peaceful life she built through yoga and meditation. 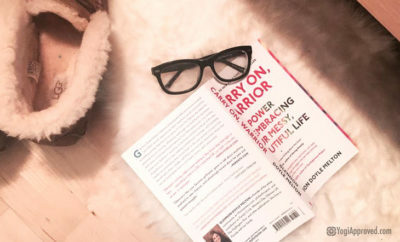 This book also includes step-by-step yoga sequences and delicious, healthy recipes for readers to try, and her story oozes a courageous and charismatic energy that will inspire anyone to follow their dreams. 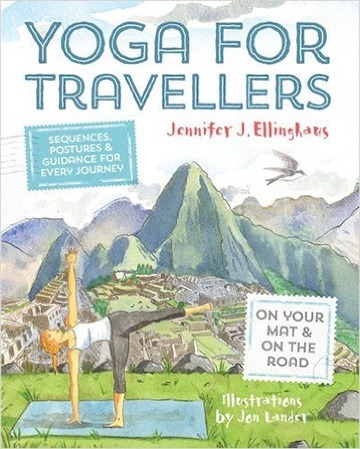 As the name suggests, this is great for travelling yogis. This little gem of a book is only 15cm tall and 17cm wide, making it ideal to throw in your backpack and read on the road. 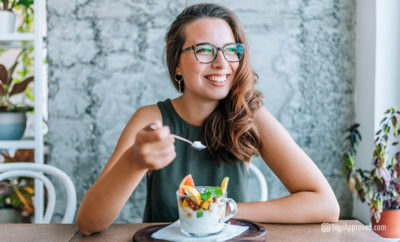 The book includes many personal stories and tips on how to deal with the inevitable ups and downs of life on the road, such as connecting with others when travelling alone. 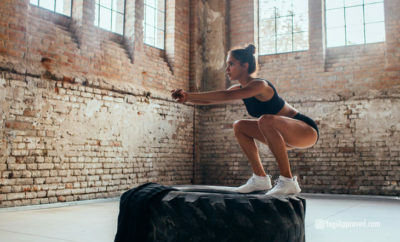 The book also includes creative yoga sequences for every conceivable space and situation possible, from tiny dorm rooms in hostels or in a cramped city hotel where practicing on the roof might be your only option. The illustrations (including the simple stick figures) are adorable and the writing is funny, uplifting and compassionate. This is a very helpful and practical book to encourage any yogi to maintain their practice regardless of where they are or what they are doing. 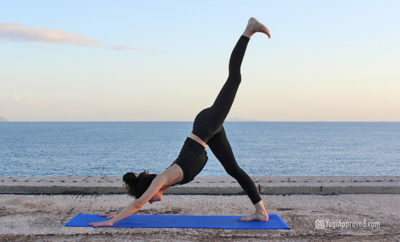 The author shows just how adaptable yoga can be and how liberating it can feel to practice by a prehistoric lake, atop a mountain after hours of trekking, or on a wooden balcony overlooking a rain forest. This is a personal favorite, and I take it everywhere with me (it has recently been to Nepal and I am taking it to Bulgaria this September!). I look forward to the day that it becomes lovingly dog-eared from being reread and constantly stuffed into my backpack. This is a slightly more academic book for readers who crave something challenging to sink their teeth into. This is a great text for yogis in teacher training, or for those who enjoy heavier philosophical tomes. Pandit Rajmani Tigunait is the spiritual head of the Himalayan Institute, leading voice of YogaInternational.com and is the successor of Sri Swami Rama of the Himalayas. 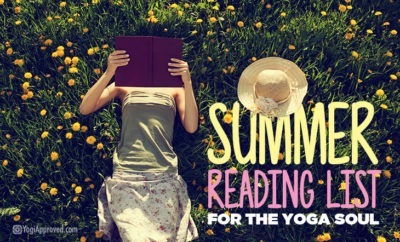 Within the chapters of this book, Tigunait shares wisdom from the yoga tradition, practice-oriented commentary, and nuts-and-bolts instruction that can help readers take their practice to a new level. This book underscores the living appeal of yoga study as a vehicle leading to meditative practice. 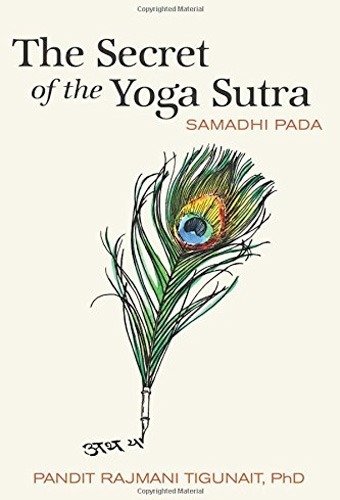 Readers can use this text as a guide to unlock the hidden power of yoga and meditation and develop a more in-depth understanding of Patanjali’s Yoga Sutras. Each sutra includes the original Sanskrit verse, along with an interpretation, and commentary that breaks down the meaning of the sutra for yogis to adapt to modern life. The Secret of the Yoga Sutra is a limited edition book, so you may want to get your hands on a copy now! This book is a breath of fresh air for those in need of a spiritual and holistic read. Caroline Myss teaches you to see your body and spirit in a new way, and provides you with skills that encourage spiritual growth and tools that inspire new wisdom about the body. This book will change your outlook on life. 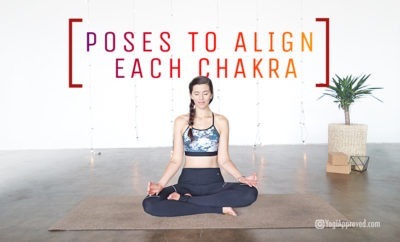 Throughout the chapters, Myss delves into the Hindu Chakras, Christian Sacraments and the Kabbalah’s Tree of Life to demonstrate our seven stages of higher consciousness and the seven physical aspects of the body in need of healing as we travel through each stage. Myss demonstrates how you can develop your own intuition to better understand your body, it’s subtle energies, and your traumas locked deeply away within the areas of the body that can cause dis-ease. This book teaches us the root of most dis-eases and how to heal them, along with the chakras that are out of balance. 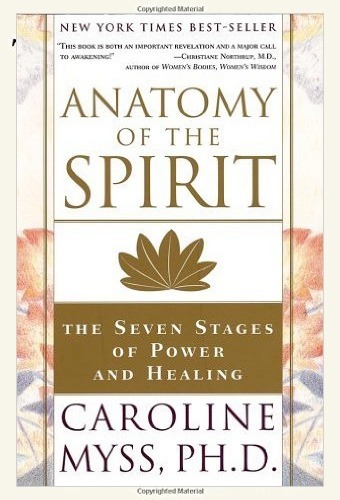 From start to finish, Anatomy of the Spirit is a thought provoking and intriguing read. I enjoy sharing books with others and would love to hear from you about your opinion of the books in this review. Did you enjoy them as much as I have? 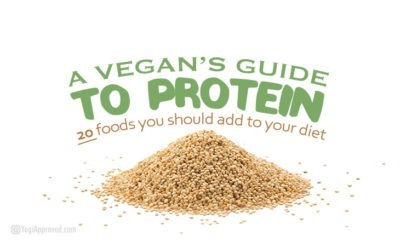 I would also love any recommendations from readers in the YogiApproved community. Happy reading beautiful yogis, and I hope you have gorgeous fall! 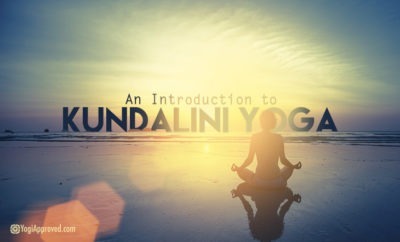 I Love Yoga So Much, I Wrote a Book About it!